There is so much to do in preparation for the Thanksgiving feast tomorrow, but I wanted to quickly write about the tasty harvest meal George and I had for dinner last night. As I previously wrote, I went a little hog-wild, or legume-wild I should say, at the Alhambra Farmers’ Market on Sunday and pretty much bought a farmers’ market sampler platter of vegetables. Wanting to eat and cook as much of the produce as possible before Thanksgiving, as it most likely will not get eaten afterwards, I created a culinary plan to make “harvest meals” every night this week. Sunday night, as my previous posting indicates, was somewhat of a success. The blackberry-red wine reduction was a culinary travesty, but our roasted vegetables and plum tart were huge successes. 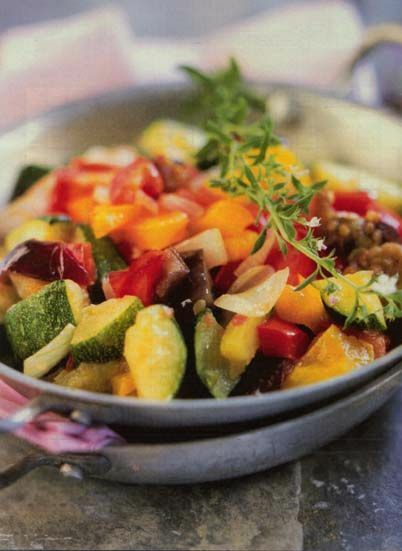 On Monday, I had good intentions of making a ratatouille with the fresh zucchini, eggplant and tomatoes I bought, but due to an unanticipated, and fortunately very short-lived illness, George had to take over cooking Monday’s dinner and he passed on making the ratatouille. He did make a mean taco and we saved the ratatouille for last night. So…Ratatouille. Admittedly, I wanted my ratatouille to resemble Remi’s ratatouille in the movie Ratatouille, but I decided to simplify the ratatouille recipes I found and just make more of a ratatouille hash. Chopping up an onion, a few small zucchini, eggplant and tomatoes, I sauteed the vegetables in a little olive oil and seasoned them with salt, pepper, pepperincino flakes, oregano and a lot of fresh basil. It wasn’t bad! It was a very light and very fresh side-dish that was served next to baked chicken breasts. Of course the ratatouille could have been so much more, but for a quick and easy mid-week harvest meal, it couldn’t have been more perfect. So keeping in step with the culinary theme this week, a huge dent was made in our agri-rator (a refrigerator full of agricultural produce) and in the spirit of the Thanksgiving week, another harvest meal was had! On deck for tonight’s harvest meal….something with green beans! PS – As a quick aside, I did remember to properly salt my eggplant for the ratatouille. I began salting the eggplant about an hour before I was ready to use them. The salting process really makes all the difference – my eggplant was actually edible this time! This entry was posted on November 26, 2008 at 6:31 pm and is filed under Farmers' Markets, Recipe Ideas. You can follow any responses to this entry through the RSS 2.0 feed. You can leave a response, or trackback from your own site.